Stir the granulated sugar and cornstarch in a medium bowl. Add the cherries and toss to coat. Unfold 1 pastry sheet on the baking sheet. 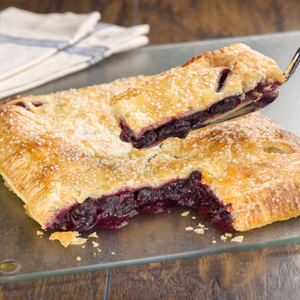 Arrange the cherry mixture on the pastry sheet to within 1-inch of the edge. Brush the edges of the pastry sheet with the egg mixture. 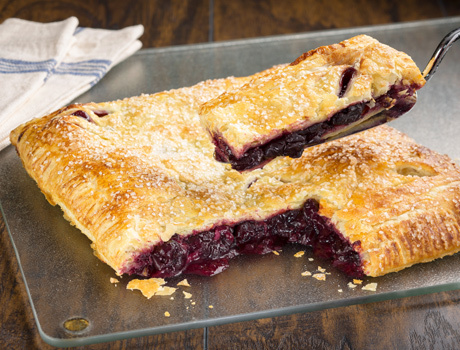 Unfold the remaining pastry sheet, place it on top and crimp the edges with a fork to seal. Brush with the egg mixture. Using a sharp knife, cut about 8 slits in the top of the pastry. Sprinkle with the sanding sugar. Bake for 30 minutes or until the pastry is golden brown. Let the pastry cool on the baking sheet on a wire rack for 30 minutes.